When I’m after carp I prefer to use floating baits such as bread crust or dog biscuits. The anticipation as a fish nudges its way through the reeds towards your bait has to be experienced to be believed, and the final moment when the carp mouths my crust – will it take or won’t it? – finds me holding my breath for several seconds. Exciting? I’ll say it is! Piking is a bit different, but the thrill is just as great. My spoon wavers along in the clear water and I raise the rod to hold it in position next to a little bay in the weeds. As it hovers and flashes before my eyes I’m totally riveted, almost hypnotised by the motion. Suddenly, faster than the eye can follow, a lean, green streak of a fish lunges out from the weeds, the rod tip plunges down and the reel screams. Again the buzz is almost mind-blowing. You’ve got the message, I’m an adrenaline junky. Afew years back I encountered a method of bass fishing that is quite the equal of this freshwater action in terms of anticipation and excitement. To begin at the beginning, a pal of mine and a member of BASS, Steve Butler, had begun to experiment with surface popping lures for bass. Poppers were developed for catching largemouth bass in the USA and according to Steve’s results they were also pretty effective for our native sea fish. In 2001 my pal Alan Vaughan had visited Steve to learn the rudiments of popper fishing. Later that year, when he came down to Dorset to fish with me, Alan couldn’t wait to give me a few tips on the method and I was keen to have a try. To cut a long story short, as soon as I hooked my first bass on a Chug Bug I was addicted. horizontally like a stick or with the tail hanging down and the head up. Instead of a diving vane they have a flat or concave front end, which causes lots of surface disturbance when you jerk the rod or turn the reel. Chug Bugs, Skitterpops, Yo Zuri Mag poppers, TD Pencils, Bass Busters, and so on are all are effective and work in much the same way, although some make more disturbance than others. Whatever lure you use it is essential to keep the hooks needle sharp and the line tight from rod tip to popper. It’s a beautiful midsummer day, the sun is shining and there’s a light, offshore breeze. You’ve arrived at the coast armed with a spinning rod and a reel loaded with 20lb braid. Ashort (1m) trace of 20lb clear Amnesia is looped to the ring on the front of the popper. It’s half tide, and the kelp fronds have just gone below the surface. You cast out your popper, watch it splash down on to the glassy surface and flick over the bale-arm of the reel before tidying the line on the spool with a tug of your hand – no rush, the lure’s not going to sink. Point the rod at the becalmed lure, wind steadily to take up the bow in the line and then make a couple of fast turns of the reel handle and stop. The lure jerks forward, spraying water in front of it. You watch the popper carefully as it lies on the surface then, after a few seconds, you repeat the two fast revolutions and the splashing movement. If you wanted you could jerk the rod instead of reeling. This would also cause the lure to spray but would be more likely to cause slack line and tangled braid. When the lure has worked its way back to the rod tip you lift it out, cast again and the whole process is repeated. On your third cast, as the lure rests between two pops, you notice a tiny ripple beside it. This time you give the reel just half a turn. Yes, that was definitely a swirl and was that a glimpse of a prickly fin beside the stationary popper? Again you twitch the lure slightly and you are shocked and thrilled in equal parts as 4lb of silver torpedo rockets from the calm surface with your popper hanging from its mouth. The fish crashes back in. No need to strike, the non-stretch braid has done its work, the rod is already bending and the fish is on. As the clutch buzzes to give line your heart still pounds from the excitement of the take. This is real fishing. Frequently there will be no warning of a take. Your lure may simply disappear in the middle of a huge swirl or, perhaps more likely, there will be a boil and the rod will simply bend to the weight of a fish. Why are popping lures so effective? 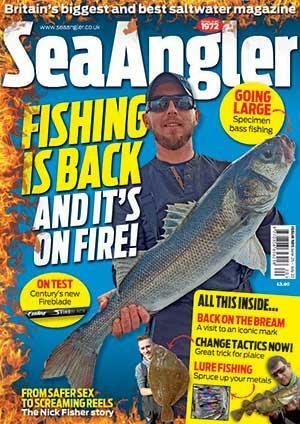 Well, most bass anglers will have seen fish attacking sprats or sandeels near the surface. Understandably the little fish try to escape by rushing away in what’s described as a ‘flash expansion’. If they are just under the surface dozens of the tiny prey fish may spray out and plop back again, like a mini squall of rain falling on the sea. The striking bass themselves may throw up a spray of water. These splashy signals shout ‘prey are here’ and understandably this attracts other predators to the area. The ‘pops’ of your lure give off the same sort of come hither signal and bass from many metres distant may be attracted to the popper. When the predators arrive they see a little disabled ‘fish’ floating at the surface. A chance too good to miss? Perhaps surprisingly, bass will come up to attack poppers in quite deep water as well as in weedy, snaggy shallows. I’ve had good fish in only inches of water and one of my pals described to me how he watched several big bass swim up from a ledge a few metres down to inspect his lure. There’s still plenty to learn about this fascinating technique. Does it matter how long you let the lure pause between pops? Is it best to cause a big splash or a small sprinkle? This may depend on things like how calm the sea conditions are. Is it worth having a really ‘fish-like’ popper? After all, the bass often take it when it’s stationary in gin-clear conditions. Would it help to add a bit of flavour to the lure? Since the fish sometimes look closely before they strike a bit of added incentive may do no harm. One thing’s for certain, popping is a recipe for heart attacks but if you keep that braid tight and those hook points needle sharp the bass won’t be the only thing that gets hooked.